In our Pacific Angler Friday Fishing report last week we announced the pending SUMMER SUPER SALE and now we will tease you with the list of the deals but NOT all the deals, come and see what else we have cooked up!! Speaking of cooking, once again we will be whipping up a FREE BBQ (Donations to Steelhead Society of BC are greatly appreciated) with supplies donated by Vera's Meats , because "you can't beat Vera's Meats!" 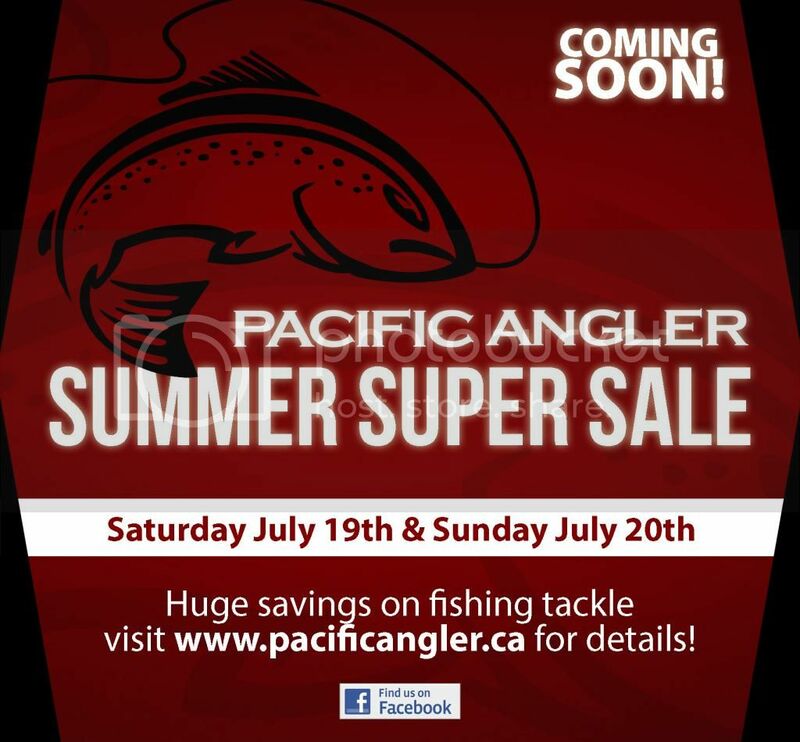 The entire Pacific Angler Team welcomes you to Our Biggest Sale Ever! This is your chance to get geared up for the summer trout and salmon fishing with some of the best deals in town on quality gear! Come down, enjoy the BBQ and take advantage of serious savings throughout the entire store. See something in the store that is not on this list? No problem, the time to ask for a deal is this weekend because we are ready to help you save big! Everything in store is on sale at a minimum of 10% OFF. After that you can look for hand-picked items by the staff at PA which they have sale-priced from 15-50% OFF! Amazing Deals - Awesome Products! -Build your dream combo for fly fishing, saltwater fishing or freshwater fishing, 15% OFF! General Sales List - EVERYTHING IS ON SALE! -Millions of Sockeye are coming and we have bottom bouncing weights. Get them now while you can and save big! 25% OFF all bottom bouncing weights! -Abel mooching reels, 10% OFF, lots of colors to choose from! -Pesca, Coyote, Kingfisher spoons 15% OFF, huge selection! -The chinook are coming! Get your anchovies and herring now at 15% while supplies last! -All Flies 20% OFF BC’s largest selection! -All Fly Boxes 15% OFF, lots to choose from! -Assorted discontinued fly lines or old packaging 50% OFF! Some great lines to choose from for trout, salmon, steelhead! -Trophy QR Mooching Reels reg. $299.99 now $249.95, we have gold, blue, slate in stock! -Rapala Shift Mooching Rod reg. $299.95 now 30% OFF! 5 year warranty, 2 only. -Fenwick Elite Tech 6’8” Trout Rod. This is an amazing medium/light trout rod. Reg $169.99 now 30% OFF while supplies last! 5 only. -G. Loomis Dredger, GLX, 14 foot, 9/10. Awesome Spey rod for the Thompson or Skeena. Lightly used, reg $995, 40% OFF, 1 only! -Sage 10151-4 Graphite IV Spey rod. If you want to bomb big casts on big rivers with a long belly, this is the rod for you. Reg. $970, 50% OFF, 1 only! -TFO Lefty Kreh TiCr2 rod. 8’ 6”, 500-600 GR, specifically designed for blue water fly fishing by Lefty. This is a great rod for big dorado, tuna, sailfish, and tarpon. Reg $350, 40% OFF, 1 only! -G. Loomis Cross Current 9 foot, 10 WT, 3 piece. Great rod for tarpon, jacks, and chinook. Lightly used. $250! 1 only! -Sage 2080 Reel, 7-9 WT Fly Reel, $225, 30% OFF, 1 only! -Hardy 3-7/8” Taupo Perfect, made in England. Reg $695, 30% OFF, 1 only! -Hardy Bougle MK VII 3-1/2”. Reg $549.95, 30% OFF, 1 only! -Abel Super 14 Reel. Reg $985, 40% OFF, 1 only! -Abel Super 4N. Reg $500, 40% OFF, 1 only! AND LOTS MORE - TOO MANY TO LIST! All prices are subject to change - quantities are limited - sales prices and deals apply only to in-stock items. All sales are FINAL. From all of the staff at Pacific Angler we look forward to continuing to be "Vancouver’s Store for the Fishing Enthusiast".